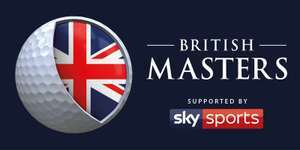 Free Golf British Master 2018 Tickets. 10,000 available for Thursday 11th October 2018. Great extra birthday present for Dad, not bad with ticket prices just £15 for the Friday, too. Got 2 and confirmation already. Great extra birthday present for Dad, not bad with ticket prices just £15 …Great extra birthday present for Dad, not bad with ticket prices just £15 for the Friday, too. Nice one. Very kind gesture for your father. You are very welcome. Pleasure to help. Went to the Sunday this year (got free tickets with My Sky app), was a cracking event. Bit far to travel from Scotland to this one, but seems fair as the last one was up north. Think this is a great event to take kids to and get them into golf. Went to the Sunday this year (got free tickets with My Sky app), was a …Went to the Sunday this year (got free tickets with My Sky app), was a cracking event. Bit far to travel from Scotland to this one, but seems fair as the last one was up north. Think this is a great event to take kids to and get them into golf. I totally agree Kev. I saw it at The Grove, Watford the previous year and I loved it. I hope you get the chance to see more of these events in future. Thanks for the kind vote and wonderful feedback. Wow - all gone it seems. Have you tried securing any Friday tickets @ £15 each? Try getting the Friday tickets for £15? I did notice that on the tickets, it doesn't specify the day that the tickets are for, just the whole event dates....or is it me?!?!?! I'm so sorry. Have you tried securing the Friday tickets for £15 each? Managed to get 2 tickets for my Dad for Christmas, thanksI did notice that …Managed to get 2 tickets for my Dad for Christmas, thanksI did notice that on the tickets, it doesn't specify the day that the tickets are for, just the whole event dates....or is it me?!?!?! Just got mine - keep trying people, its said Sold Out but then I refreshed and came available again. Agreed that date and time box says the whole event (Wed-Sun) but bottom line of ticket says "Type: Adult Thursday Ticket"
Hi Kate. Wonderful news. Your dad will love the tickets. Please check your e-ticket. Free tickets are only available for the first day (11/10/2018). Please keep trying Pootled. You may need to just refresh the page? Have you tried purchasing the Friday tickets @ £15 each? Oh dear. That's quite quick. Have you tried securing the Friday tickets @ £15 each? I love that nickname "muntyflumple"
Sorry that free tickets have sold out. Have you tried securing the Friday tickets for £15 each? Oh dear. That's quite quick. Have you tried securing the Friday tickets @ …Oh dear. That's quite quick. Have you tried securing the Friday tickets @ £15 each? Thank you but going to wait a bit cause they’ll be more free tickets available else where. Thank you but going to wait a bit cause they’ll be more free tickets a …Thank you but going to wait a bit cause they’ll be more free tickets available else where. You are right Dionne. Sky will offer their customers the opportunity for free tickets too. Do you have the sky app? Please keep trying Pootled. You may need to just refresh the page? Have …Please keep trying Pootled. You may need to just refresh the page? Have you tried purchasing the Friday tickets @ £15 each? Heat For the post though. Bless you Pootled. Thank you. "Any resale of a ticket will rendor it void. The tciket remains teh property of teh tournament at all times." "Any resale of a ticket will rendor it void. The tciket remains teh …"Any resale of a ticket will rendor it void. The tciket remains teh property of teh tournament at all times. "Web designer can't spell. Cheers John. Thanks for the update on the T&C's. However no one on here has mentioned any attempt to sell free tickets. Cheers John. Thanks for the update on the T&C's. However no one on here …Cheers John. Thanks for the update on the T&C's. However no one on here has mentioned any attempt to sell free tickets. It's the bad spelling I'm more concerned about. So sorry Haddas. Sky are likely to offer some tickets soon. If you have the Sky app then you may get more?